NL210 series diode pumped Q-switched lasers produce up to 10 mJ at 1000 Hz pulse repetition rate. 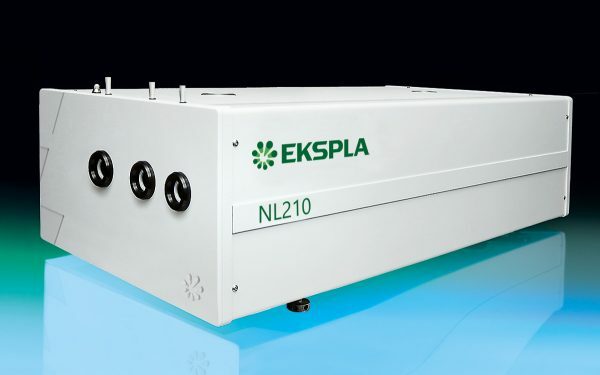 The laser is designed to produce high intensity, high brightness pulses and is targeted for applications like OPO pumping, nonlinear spectroscopy, material ablation, micromachining, and other tasks. Employing electro-optical type of the cavity dumping, the master oscillator can produce pulses with a short pulse duration of 3 – 4 ns, the uniform beam profile and low divergence. The M² factor of the beam is typically between 3 – 4. Laser cooling uses a closed loop chiller, thus eliminating the need for external cooling water, and reducing running costs. Angle-tuned LBO and/or BBO crystals mounted in temperature stabilized heaters are used for optional second, third or fourth harmonic generation. The harmonic separation system is designed to ensure a high spectral purity of radiation directed to separate output ports. For customer convenience the laser can be controlled from a remote control pad or USB interface. The remote pad allows easy control of all parameters and features a backlit display that is easy to read even wearing laser safety eyewear. Alternatively, the laser can be controlled from a personal computer with supplied software for a Windows™ operating system. LabVIEW™ drivers are supplied as well. Due to continuous improvement, all specifications are subject to change without notice. Parameters marked typical are not specifications. 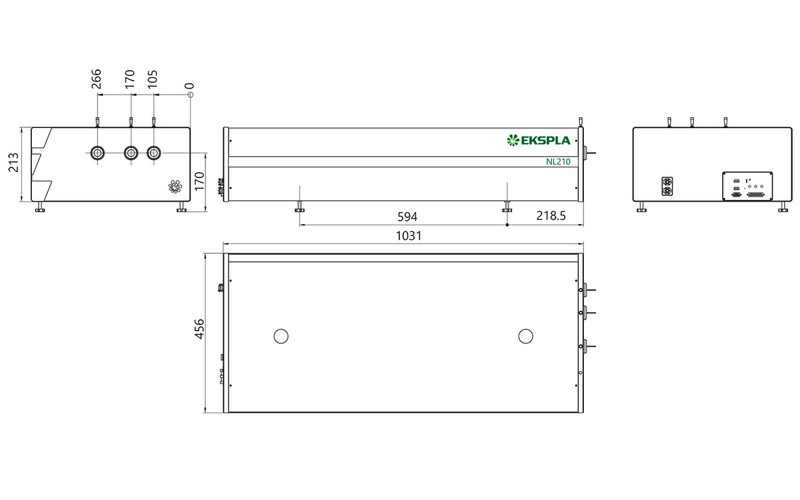 They are indications of typical performance and will vary with each unit we manufacture. Unless stated otherwise, all specifications are measured at 1064 nm and for basic system without options. For NL210-SH option. Outputs are not simultaneous. The laser performance is specified for SH wavelength; specifications for other wavelengths may differ from that indicated above. For NL210-SH/TH option. Outputs are not simultaneous. The laser performance is specified for TH wavelength; specifications for other wavelengths may differ from that indicated above. For NL210-SH/FH option. Outputs are not simultaneous. The laser performance is specified for FH wavelength; specifications for other wavelengths may differ from that indicated above. Full angle measured at the 1/e² point at 1064 nm. 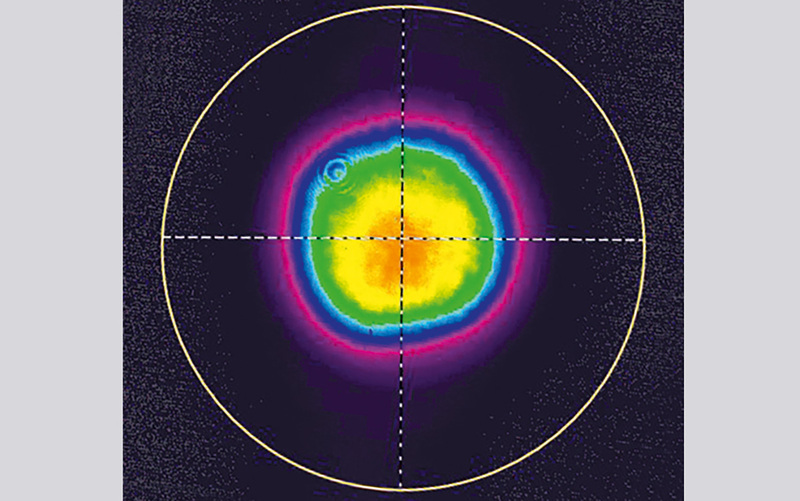 Beam diameter is measured at 1064 nm at the 1/e² point. Optical pulse jitter with respect to SYNC OUT in internal triggering mode. Optical pulse jitter with respect to QSW IN in external triggering mode.